We’d love your help. Let us know what’s wrong with this preview of The Political Writings of St. Augustine by Augustine of Hippo. Anyone with a better than cursory knowledge of politics knows that a people's deepest values - their religious values - are what determine whether a society will prosper or fail. And anyone with a more than cursory knowledge of history knows that there was once an entity called Christendom - a political society self-consciously in obeisance to a total Christian view of lif Anyone with a better than cursory knowledge of politics knows that a people's deepest values - their religious values - are what determine whether a society will prosper or fail. And anyone with a more than cursory knowledge of history knows that there was once an entity called Christendom - a political society self-consciously in obeisance to a total Christian view of life. To ask other readers questions about The Political Writings of St. Augustine, please sign up. 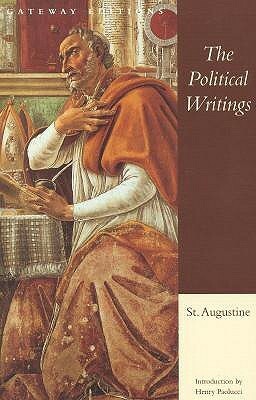 I currently have "The Political Writings of St. Augustine", but I'm wondering if it would be better to read "The City of God" instead to put Augustine's political theories in better context of his overall thinking? Covering almost 360 pages, the vast majority of it being the words of St. Augustine, this book’s quality comes down to the introduction by Henry Paolucci and the appendix containing a lecture by Din The most important voice in political thought throughout the Middle Ages, influencing even St. Aquinas, was that of St. Augustine. Through excerpts of sermons, letters, and selections from City of God, the 4th-century theologians’ view of the world of man is shown both in its maturity and development. This edited volume from E. M. Atkins and R. J. Dodaro stands out because it consists entirely of letters and sermons from Augustine. Rather than draw upon selections from De civitate dei, De vera religione, or various pamphlets published against perceived heretics, Atkins and Dodaro stick exclusively to a smattering of more practical literature—letters and sermons. “It is easy to forget that [Augustine] was, before all else, a Christian pastor,” they write. Whereas his writing in Confessions or This edited volume from E. M. Atkins and R. J. Dodaro stands out because it consists entirely of letters and sermons from Augustine. Rather than draw upon selections from De civitate dei, De vera religione, or various pamphlets published against perceived heretics, Atkins and Dodaro stick exclusively to a smattering of more practical literature—letters and sermons. “It is easy to forget that [Augustine] was, before all else, a Christian pastor,” they write. Whereas his writing in Confessions or his magnum opus, De civitate dei, is often committed to developing large-scale ideas or biblical exegesis, “we find Augustine reflecting on practical issues as they arise” in his letters and sermons, answering requests, interceding with Roman authorities, debating opponents, or advising friends (xii). For my part, I maintain that their decision to move away from the more well-known works of Augustine works quite well; the intellectual intimacy afforded by his letters and sermons offers readers a unique opportunity to immerse themselves in the colorful world of Augustine’s brilliant mind. Moreover, these letters and sermons touch upon a wide variety of political topics, from judicial authority to war and peace. Augustine never missed an opportunity to advise a friend on Christianity and Roman citizenship or correct a Donatist rival for his simple-minded views on rebaptism and the sacraments. In these letters and sermons, Augustine relates intimate encounters with people of his flock and articulates robust political assertions rooted in theology. For example, with respect to the former instance, in a letter written to Alypius, another North African bishop and lifelong friend of Augustine, the saint describes a personal interview with a small girl who was captured by, then saved from, slave traders. “I myself asked one girl how she had come to be sold to the slave-traders. (She was among those freed by the efforts of our own church from this pitiful state of captivity.) She replied that she had been snatched from her parents’ house. I went on to ask whether the kidnappers had found her there on her own; she replied that they had done it when her parents and brothers were actually there. In fact, the brother who had come to fetch her was there too, and he explained to us—as she was quite small—how they had done it” (44). In this same letter, Augustine encloses an imperial law he thinks might check the sudden influx of slave traders around Hippo Regius. However, he is worried that the punishment prescribed by the law—beating with leaden whips—is too harsh, and therefore writes to Alypius, influential at Rome, to persuade the “Christian emperors” to publicize the law but exempt those prosecuted under it from such brutal treatment. The entire affair demonstrates Augustine’s deft political maneuvering, his moral opposition to cruel punishment, and his keen concern for the lives of everyday Christians. It is a remarkable letter that, in fact, only recently came to light. With respect to the latter instance—when Augustine formulates his political philosophy—a noteworthy example derives from a letter to Emeritus, a Donatist North African bishop whom Augustine repeatedly attempted to persuade to rejoin the Catholic Church. In one section, Augustine explains, with reference to the Hebrew prophets and the apostle Paul, why bad people do not exert undue influence over good people by mere association. “If so many unjust individuals within the one people of God did not make the prophets who witnessed against them like themselves; and if the mass of false brethren did not turn the apostle Paul into someone who sought what belonged to himself rather than to Christ Jesus, even though he was a member with them of a single church [cf. Gal. 2.4; 2 Cor. 11.26]; then it is obvious that a man is not made bad just because some bad person approaches Christ’s altar with him” (138). For Augustine, this axiom is self-explanatory. He understood that the Church welcomes questionable people into its ranks by virtue of its universal mission in the world. The goodness of this mission, however, does not slavishly depend upon the moral innocence of the Church’s members, not even its clergy. Augustine recognized the ineluctability of human failing, especially in himself. He was not prepared, like Pelagius, to spurn people from communion with God and fellow Catholics on the grounds that they were unable to obey God’s commands. When fault is known, of course, it should be condemned and corrected; but when it is not, “no one can be contaminated by the unknown crimes of unknown persons” (137). Thus, those Catholics in the East, for example, with no knowledge of the supposed crimes perpetrated by Catholic bishops during the Great Persecution, did not need to worry about the state of their souls. According to Augustine, the Donatists stood completely alone in their supposed purity. While Augustine’s attitude toward institutional purity in this letter pertains to the Church, his claims certainly apply to contemporary institutions other than the Catholic Church. Governments, for example, share with the Church a mission to protect and, in some instances, better the communities over which they have jurisdiction. Like the Church, however, governments often employ and citizens often elect officials with questionable moral characters. If we follow Augustine, “bad people” at the helm of administration do not make a government bad by mere association. Of course, they may make it bad through concerted effort condoned by those around them or without a proper system of checks of balances. But in and of itself, the fact that a “bad person” administers, say, a government program that provides unemployed citizens with financial assistance, does not make that government program or the consequences of that program bad. Those unemployed citizens will benefit from the financial assistance they receive regardless of the moral character of the bureaucrat in charge. When evaluating the goodness of an institution or the moral efficacy of its programs, an Augustinian approach is important. It works when examining the Church, governments, school boards, and charities. As a practical matter, Atkins and Dodaro have arranged this edited volume remarkably well. A succinct introduction precedes the thirty-five letters and sermons of Augustine, followed by extraordinarily helpful biographical entries that provide essential details about the lives of Augustine’s distinguished correspondents. In addition, their flurry of endnotes nicely contextualize each of the letters and sermons and cross-reference the biographical entries. Finally, Atkins and Dodaro include a lengthy bibliography that pertains to the sociopolitical world of Late Antiquity, Augustine’s political thought, and good biographical treatments of the saint. All in all, their volume is a useful introductory tool for students eager to learn more about Augustine. João Ferreira vc fala isso por causa do kogos? Isabela Baldini João wrote: "vc fala isso por causa do kogos?" não entendi!!! This is a very solid selection--I did, mirabile dictu, read City of God a while back, and have no desire to try it again. This is gives you just the right amount of it, unless you're deeply masochistic, and combines it with some far more readable letters and a solid introduction. Recommended for classrooms and anyone who wants the gist without the grind. I think this is an excellent book. please beware that if you want to read it, you must reqd cover to cover, by which I mean the explanatory commentary and you must have an intention for why you're reading it. whether you agree with the philosophy, the English translation is antiquated and times very hard to read. The sections taken from Augustine was wonderful. This basically an abridged version of City of God. It leaves out a lot of the historical and mythological aspects and focuses more on the specifically political content. This book gets 4 starts because the publishers (Hacket) decided to save a buck and print it on paper that is impossible to take notes on. Recommends it for: Anyone with gray matter. I read this in a Political Science course at Grove City College in 1974 and have saved it hoping to read it again. I remember being very impressed, especially after studying Plato and Aristotle and their views on government. I hope to read it again soon. It influenced my way of looking at how government should operate. These letters are a ton of fun. Augustine’s preeminent works are refined and polished. These catch him in action, revealing his wit, verve, keen intelligence. This work would make for a good read even if one wasn’t studying him formally. The most influential writer of Christian theology ever. A must read just do it. Quite enjoyed re-learning the base of Monotheism. Aurelius Augustinus Hipponensis, in English Augustine of Hippo, also known as St. Augustine, St. Austin, was bishop of Hippo Regius (present-day Annaba, Algeria). He was a Latin philosopher and theologian from the Africa Province of the Roman Empire and is generally considered as one of the greatest Christian thinkers of all times. His writings were very influential in the development of Western C Aurelius Augustinus Hipponensis, in English Augustine of Hippo, also known as St. Augustine, St. Austin, was bishop of Hippo Regius (present-day Annaba, Algeria). He was a Latin philosopher and theologian from the Africa Province of the Roman Empire and is generally considered as one of the greatest Christian thinkers of all times. His writings were very influential in the development of Western Christianity. According to his contemporary Jerome, Augustine "established anew the ancient Faith." In his early years he was heavily influenced by Manichaeism and afterward by the Neo-Platonism of Plotinus. After his conversion to Christianity and his baptism in 387, Augustine developed his own approach to philosophy and theology, accommodating a variety of methods and different perspectives. He believed that the grace of Christ was indispensable to human freedom, and he framed the concepts of original sin and just war. When the Western Roman Empire was starting to disintegrate, Augustine developed the concept of the Catholic Church as a spiritual City of God (in a book of the same name), distinct from the material Earthly City. His thoughts profoundly influenced the medieval worldview. Augustine's City of God was closely identified with the Church, the community that worshiped the Trinity. In the Catholic Church and the Anglican Communion, he is a saint and pre-eminent Doctor of the Church. Many Protestants, especially Calvinists, consider him to be one of the theological fathers of the Protestant Reformation due to his teaching on salvation and divine grace. In the Eastern Orthodox Church he is also considered a saint. He carries the additional title of Blessed. Among the Orthodox, he is called "Blessed Augustine" or "St. Augustine the Blessed".